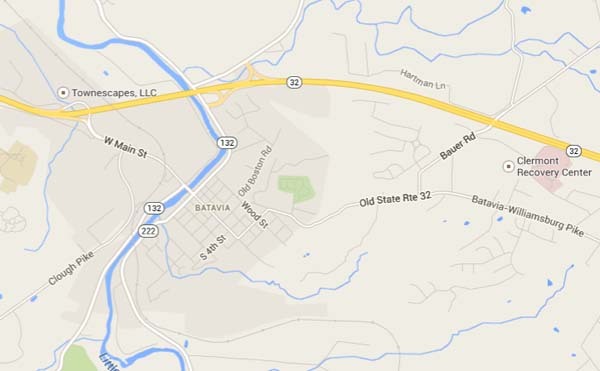 (April 2, 2019) — The Ridge will not convert the 1861 Inn in Batavia to a residential treatment group home. John McKay, managing partner of Healthcare Venture Partners, LLC, which owns The Ridge rehabilitation center, notified Batavia officials that the company is abandoning the proposed North Riverside Drive site because of the cost of construction to meet the needs and expectations of management and clients at The Ridge. The Ridge is a high-end treatment center for alcohol and drug dependency, catering to business executives, professionals, and other people who have drug or alcohol problems and can afford the amenities. Owners of The Ridge opened discussions with village officials in October about whether and where to place a new 30-day treatment facility. They first considered a site on Filager Road near the Clermont County Sheriff’s Office, and in January they dropped that idea and looked at the house at 300 N. Riverside Drive, which has been a bed and breakfast inn. The village administrator had discussions with Healthcare Venture Partners, LLC, which owns the Ridge, over a five-month period and explained requirements for building code and zoning consideration. The developers ultimately decided that the project would be too costly. Mayor John Thebout said Batavia residents will be relieved that the property will not house a rehabilitation group home. He said the village followed proper procedures throughout, and that public criticisms had been mistaken and excessive. Members of the Batavia Planning and Zoning Commission and the Batavia Village Council welcomed the plan for Filager Road. When Healthcare Venture Partners changed its focus to North Riverside, members of the two panels voiced opposition. Village Solicitor Christopher Moore and Village Administrator Dennis Nichols advised the Council not to take a position on a proposal that had not yet been made, which could be seen as obstruction of legal rights. About 90 people attended a recent Village Council meeting to oppose any plan to use the 1861 Inn property, although The Ridge had not applied for approval or bought the property. No one in the audience spoke in favor of the idea, most were opposed, and some were hostile. Several speakers accused village officials of betraying them and encouraging the development. One member of the Batavia Planning Commission gave a fiery prepared speech in which he accused other village officials of taking bribes and being cowards, and comments on social media that followed attacked Mayor John Thebout, Vice Mayor Robert Handra, other Village Council members, and Village Administrator Dennis Nichols. Nichols said the village had nothing to consider unless Healthcare Venture Partners filed a zoning application. He said that Ohio law requires local authorities to approve an application for a residential addiction-treatment facility for 6 to 16 beds, if the applicant qualifies. Members of the Village Council and the audience asked whether the village could use zoning restrictions to bar the location. Village Solicitor Christopher Moore said a village decision would depend on the details of the application, and if the developer met the standards of the law, the village could be forced to approve. If the village refused, he said, the owners of The Ridge would have basis for a suit. Moore said he cannot predict the outcome of a suit, but that a judge would decide and would consider facts that were not yet established. Nichols said that the plain language of the law binds the village, and that The Ridge would need only to follow the language of the statute to win a suit. He said the law was written specifically to stop a village or township from blocking substance abuse facilities, and Batavia cannot nullify Ohio statutes. He said that the village cannot put up barriers to frustrate a legal application without infringing on civil rights, and that the owners could appeal to federal authorities if Batavia denied their legal rights “under color of law,” which can be a felony.